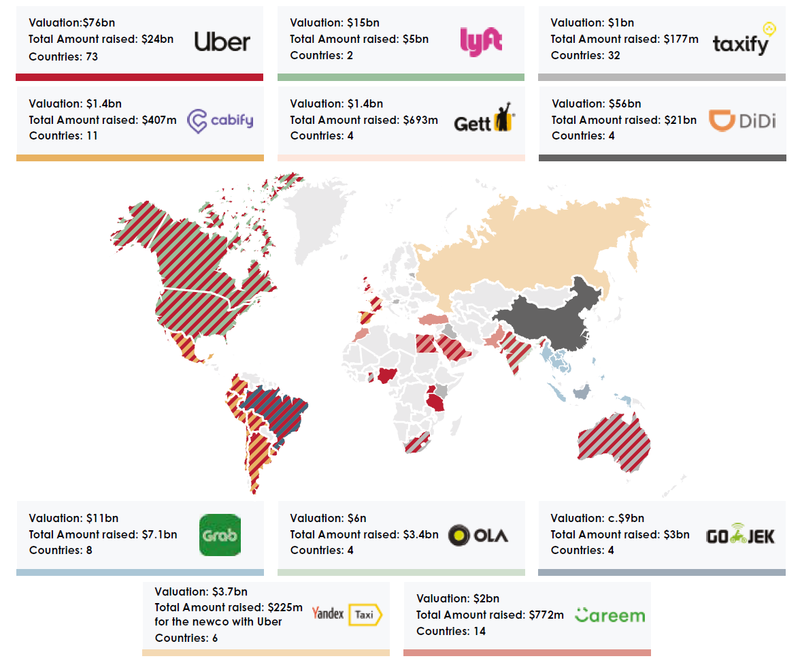 It’s an exciting time to be investing in mobility startups. Below are the current trends in the mobility industry and an overview of the startup ecosystem in Europe. While Mercedes Benz had already started to experiment with self-driving technology three decades ago, it wasn’t until recently that autonomous driving (AD) efforts really speed up. Advances in machine learning, computer vision and sensor technologies combined with more powerful computing power have resulted in a resurrection of self-driving efforts. Other factors such as the call for safer and cheaper transportation play an important role. In Europe and the US over 90% of car crashes are caused by human error. The driver is the single largest cost factor in the transportation industry and about 30% of the total cost of ownership (TCO) of a truck. Autonomous systems are essentially a combination of software and hardware to sense, perceive, plan and act. The key enabling sensor technologies onboard most autonomous vehicles are LiDAR, radar, cameras, GPS and ultrasound. The former is — on the sensor side — considered to be the biggest remaining hurdle in terms of price and performance. As the race towards autonomous driving has intensified in recent years, traditional car OEMs have built up internal self-driving know-how by acquiring leading AD startups. General Motors acquired Cruise Automation in 2016 for $ 1 billion. Recently, Honda joined the consortium by investing $ 2.75 billion in Cruise. Ford purchased Argo AI in 2017. Aptiv, a spin-off from tier-1 supplier Delphi, acquired Ottomatika and NuTonomy in 2015 and 2017 respectively. Last year, VW was rumored to be interested in acquiring Aurora. Others are partnering with tech companies such as BMW who joined forces with Intel’s MobilEye. 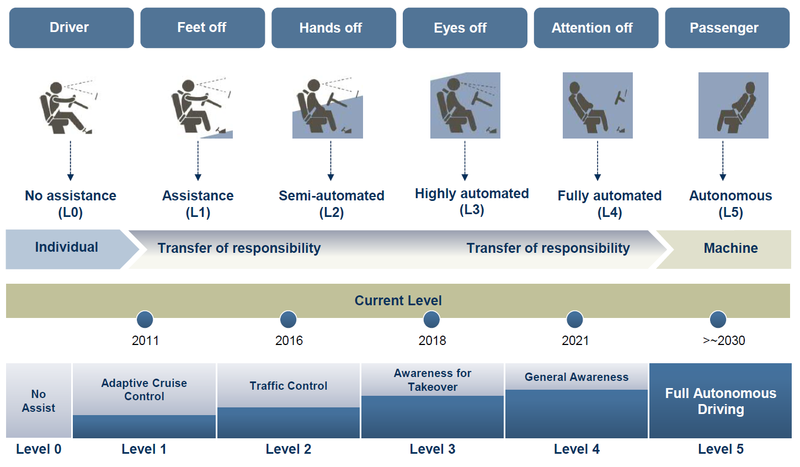 While it remains unclear when we’ll really see fully autonomous vehicles (meaning level 5 according to SAE), level 4 vehicles are expected to begin hitting the mass market by 2020–2025. 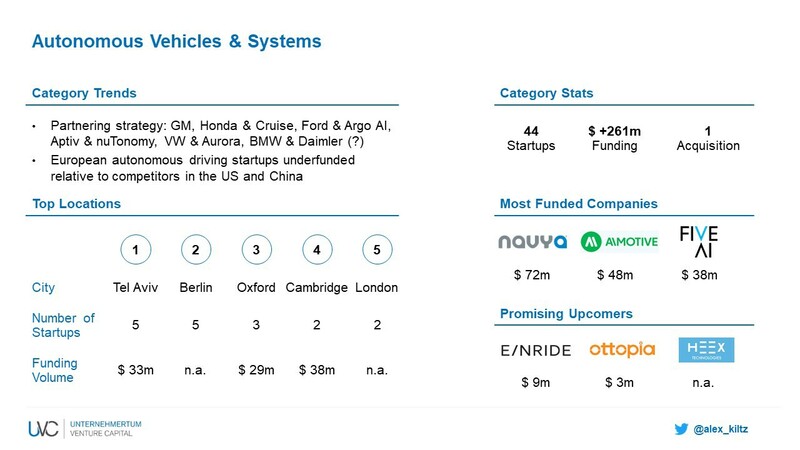 Waymo and Cruise are generally considered to be leading the race, while others such as Zoox, Nuro,Pony.ai and Aurora follow suit. The electrification of the drive train is driven by tightening emission standards and the ban of internal combustion engine vehicles in city centers such as London and Paris to decrease air pollution. Today, there is only a small number of electric car models and, unsurprisingly, the penetration rate of elective vehicles is still low. 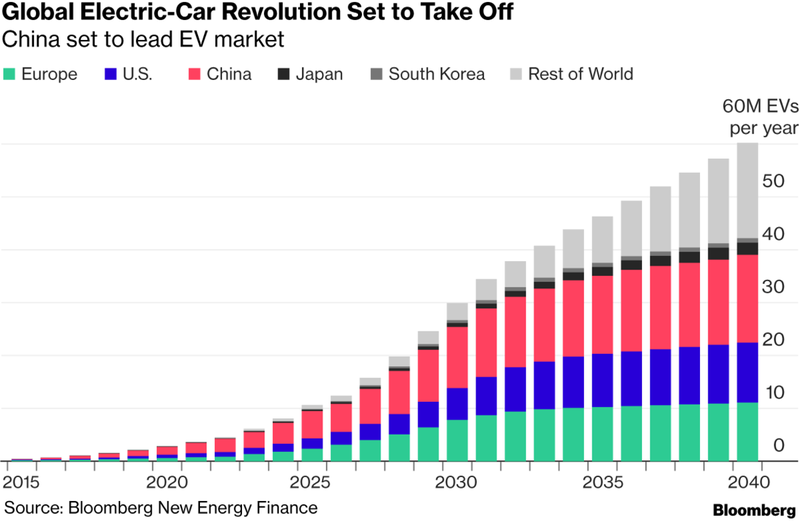 Specifically, in 2018, only 2 million electric cars were sold globally constituting a 2% market share. However, to meet fleet emission targets, OEMs announced massive R&D spending for battery technologies and efforts to increase the number of new electric vehicle models. For example, Volkswagen expects R&D expenditures of over € 30 billion and aims to have 22 million electric vehicles on the streets by 2030. BMW plans to launch at least 25 electric vehicle models before 2025. OEMs are partnering with other players in order to afford the massive technology investments and to secure the necessary know-how. For example, BMW and Daimler has joined forces and Tesla has partnered with Panasonic. While higher energy density (and thus increased range), faster charging speed and long-term battery durability remain technical challenges, a sufficiently convenient and available charging infrastructure as well as price parity of conventional and electric vehicles are prerequisites for mass-scale adoption. New mobility services entail concepts such as car sharing, free-floating vehicle fleets, carpooling and ride-hailing. There are also micro mobility services such as the recent of (e-)scooter and (e-)bike sharing. In times of decreasing car ownership and drivers’ licenses, these services cater to consumers with a preference for flexibility and freedom. Furthermore, consumers have become used to pay-per-use business models while the general concept of the sharing economy satisfies sustainable transport preferences. Ride-hailing is clearly leading this trend — both in terms of usage numbers and venture capital funding volume. Last year, ride-hailing services were used by over half a billion passengers. The proliferation of these mobility services was both triggered and enabled by the increased adoption of smartphones starting in 2007. Interestingly, the leading ride-hailing companies, Uber and Didi, both launched when smartphone penetration reached about 20% in their respective domestic markets. Today, the landscape is characterized by local players as transport preferences and habits as well as regulation differs between local markets. This is the case with e-scooters even between cities in the same country. Naturally, new mobility services are especially sought after in areas with poor public transportation systems. However, these new mobility-as-a-service concepts make it challenging for vehicle OEMs to maintain control over their relationship with the end user. Thus, cars are sometimes dubbed as data centers on wheels due to the large amount of data they generate. 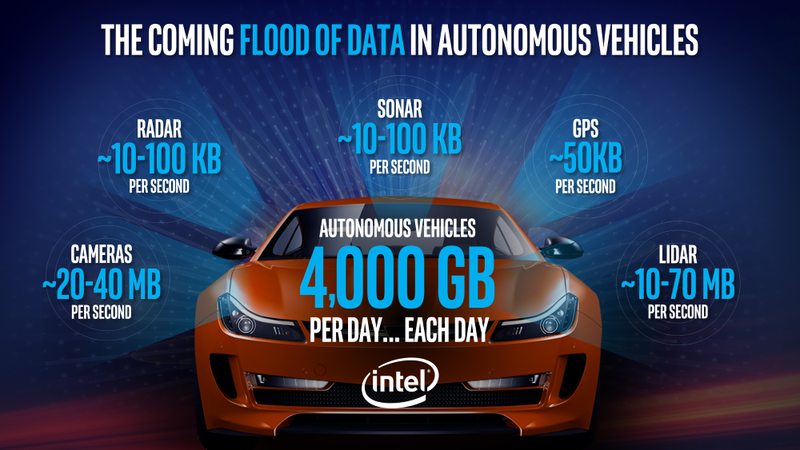 The amount of data will only increase with the rise of autonomous vehicles and is expected to reach over four terabytes of data per day. This requires powerful connectivity and computing power all the way from the vehicle to the cloud. Moreover, advanced cybersecurity around the vehicle will be needed. Currently, there are two different enabling technologies for V2X communication: Dedicated Short-Range Communication (DSRC; wifi-based) and C-V2X (cellular-based and leveraging 5G networks). With increasing connectivity and bandwidth, digital services within the car are expected to grow significantly. In ten years, they are expected to be the second largest profit pool of the automotive value chain. For OEMs it will be crucial to establish direct end-user relationships and to bundle personalized packages of services from third-party providers for these end-users to retain control of the in-vehicle connectivity and service ecosystem. Otherwise, tech companies such as Google, Apple, Amazon or Tencent will be ready to take over. As the industry undergoes rapid changes, what does this mean for the startups in this space? What are the current trends and developments? What are interesting technologies and services where startups could natural advantages? What are promising segments for venture capital investment? What are the European hotspots of mobility startup activity? How do funding levels differ across categories and countries? 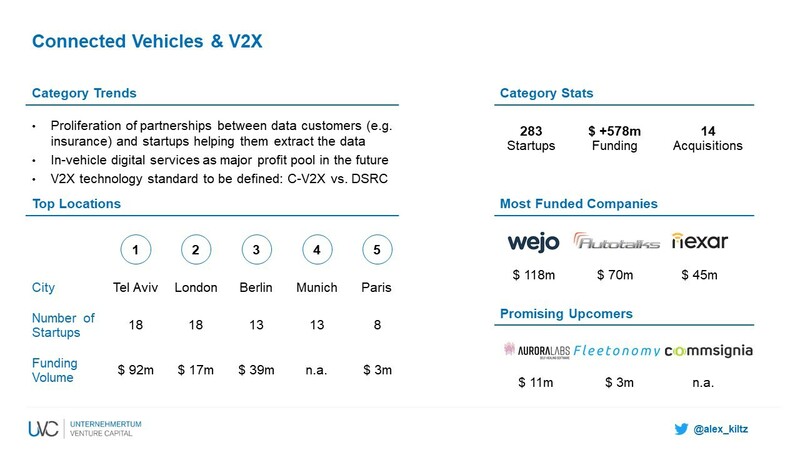 To gain a holistic overview of the European mobility startup ecosystem, public data sources such as Crunchbase, Pitchbook, Tracxn, and UVC Partners’ deal flow, and press releases were used. For the funding levels, only publicly available data was used. 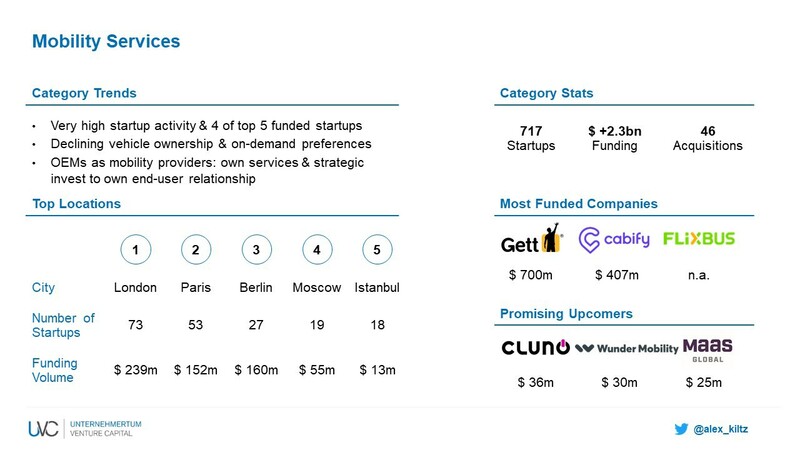 The following criteria was used to select the startups: only startups that were founded after 2008 and are headquartered in Europe (including Israel, Russia and Turkey) are considered. Over 4,500 startups were identified and narrowed down to just over 3,000. Companies that went out of business and where the primary application was not mobility-related were eliminated from the sample. Before we dive into the different market segments, here’s a high-level overview. The 3,057 mobility startups in our data set raised a total of over $ 7.5 billion. Moreover, 12 of the companies IPO’ed and 133 were acquired. In terms of the geographical spread of the startups, most come from the UK (989, 32% of all startups), Germany (597, 20%) and France (407, 13%). Not surprisingly, London (427, 14%), Paris (194, 6%) and Berlin (179, 6%) are the major hotspot cities. However, in terms of funding levels, Germany leads with $ 2.3 billion (30% of total funding), followed by Israel with $ 1.7 billion (23%) and the UK with $ 1.0 billion (13%). 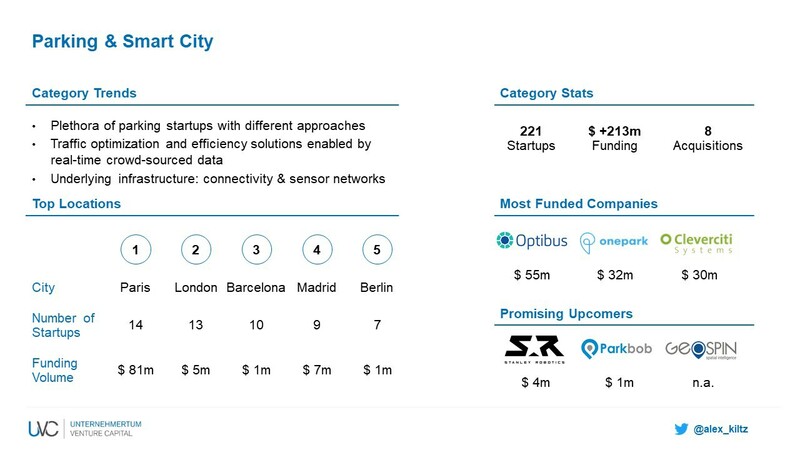 By city, mobility startups in Berlin received the most funding ($ 1.8 billion, 24%) followed by companies from Tel Aviv ($ 1.0 billion, 13%) and London ($ 0.5 billion, 7%). It is worth pointing out though, that these numbers are skewed by outliers (e.g. Auto1 or Gett). 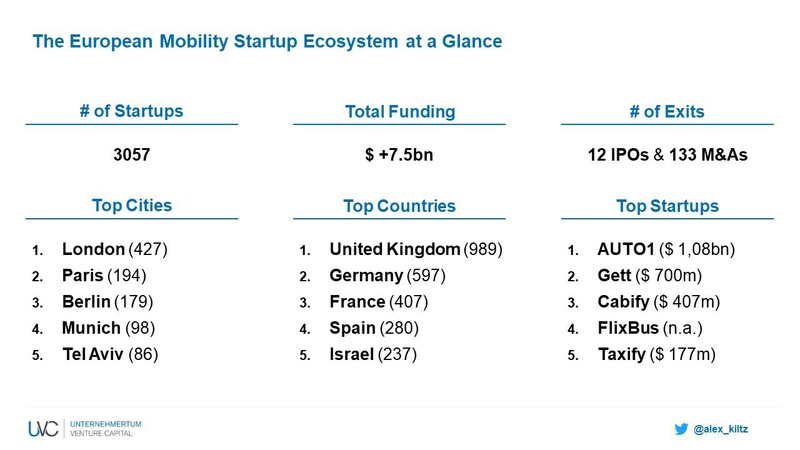 There are five mobility startups that are considered unicorns: Auto1, Cabify, FlixBus, Gett and Taxify (please note that BlaBlaCar was founded before 2008 and is thus excluded). 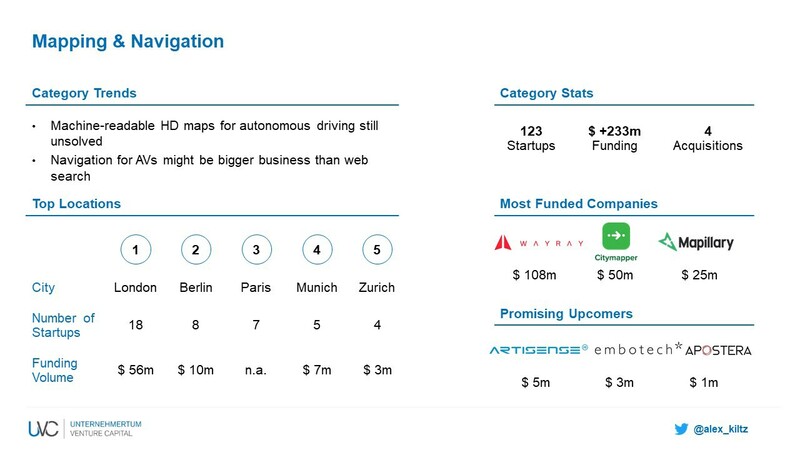 Startups in this category focus on the entire or parts of the autonomous driving stack. While some target improved Advanced Driver Assistance Systems (ADAS), others aim to develop level 5 systems. Applications range from passenger vehicles and trucks to delivery robots and aerial vehicles. Most players have a clear focus on software and use third-party hardware solutions such as sensors. Autonomous vehicles need machine-readable maps to be able no navigate safely. These types of maps are fundamentally different to the maps we use today. Startups in this category are helping to make these maps a reality. Others are working on enhancing current global navigation satellite systems (GNSS) based navigation with computer vision approaches. Path planning and companies working on heads-up displays are also included. 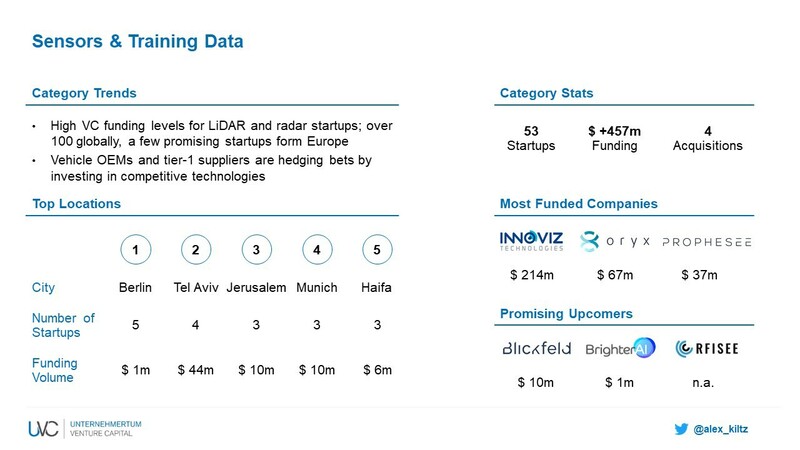 This category is comprised of sensor technology startups that focus on concepts such as LiDAR (light detection and ranging), radar, camera, GPS and ultrasound. The input from these sensors is combined through the sensor fusion process. Training data is needed to train autonomous systems to make sense of and derive conclusions from the data the sensors capture of a vehicle’s surrounding. Training data can be derived in two ways: by labeling (using image segmentation and annotation techniques) real-life images and by generating synthetic images (using generative adversarial networks (GANs) or game engines). Google’s Waymo for instance, has driven over 10 million miles on real roads and over 7 billion miles on virtual roads created with their proprietary simulation technology. Vehicles are increasingly connected to achieve higher safety and enhanced in-vehicle experiences. This category includes startups working on vehicle-to-everything (V2X) communication but also those that leverage data connectivity to offer advanced fleet management, maintenance and new digital services. Other companies focus on monetizing the growing amount of in-vehicle data and making it accessible for third-parties such as insurances or repair shops. This category entails startups offering services such as P2P car sharing, free-floating vehicle fleets, carpooling, car rental and ride-hailing. Moreover, new business models such as Mobility-as-a-Service are effectively subscription services to cars with a rental or leasing concept in the background. This category comprises all types of mobility services other than micro mobility. Roughly two-thirds of all car trips are of 10 km or less. 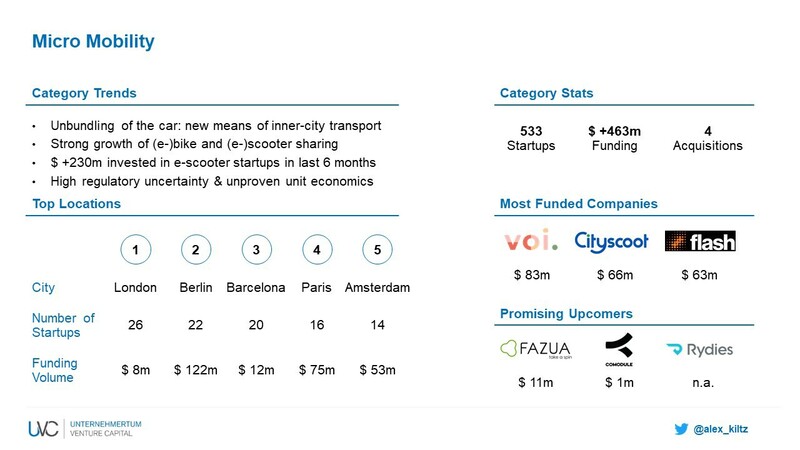 Micro mobility startups target those short-distance trips by offering (e-)bikes, (e-)scooters and similar modes of transport. They are essentially unbundling the car and help solve the first- and last-mile problem of transportation. This category also includes companies working on enabling technologies such as drive systems or connectivity solutions for these applications. 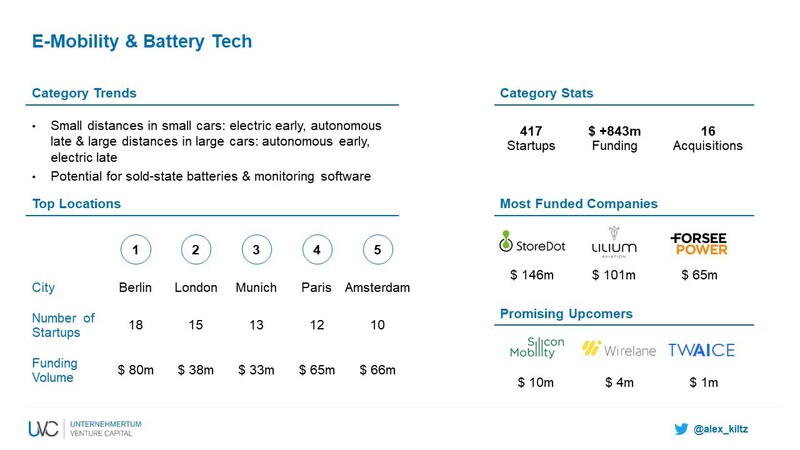 Startups in this category are working on electric charging infrastructure, fast-charging technologies, battery management systems, battery analytics solutions, and new battery technologies such as solid-state concepts. Other companies are focusing on new modes of transportation which are electrically powered. This category is comprised of startups facilitating the sale of new or used cars via online marketplaces and auctions. Aftermarket solutions and component marketplaces are also part of this category. 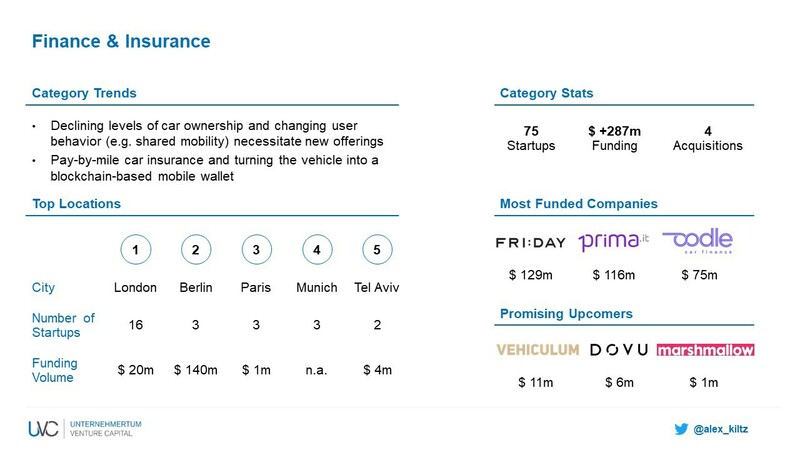 Startups providing finance and insurance products for the mobility industry are summarized in this category. Blockchain technology is used by some companies to turn vehicles intro mobile wallets and to allow for micro payments. 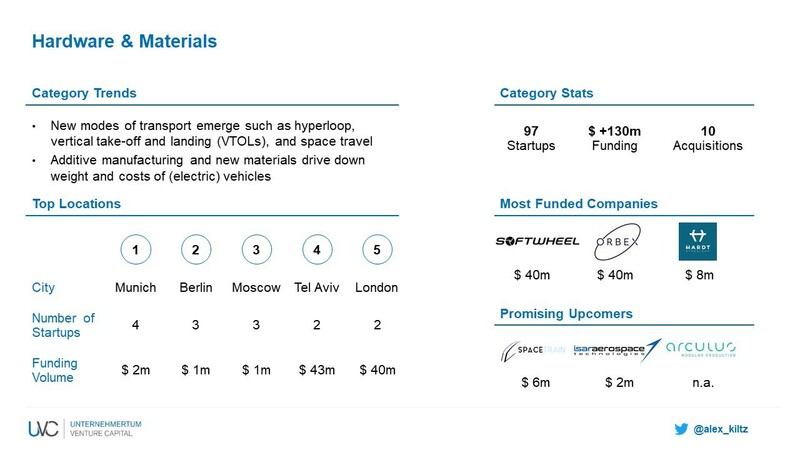 This category includes new modes of transportation such as hyperloop, space travel and startups working on new materials for mobility applications. Several startups are tackling the problem of inner-city parking and the search for available parking spaces. Offerings range from road-side and vehicle-based solutions to valet parking robots. Making public transportation and public infrastructure more efficient is another use case. These startups are helping cities to become more connected, efficient and less congested. As pointed out, the industry is going through massive changes driven by technological innovation on the one hand and social and political factors on the other hand. These factors combined with bustling startup activity and a favorable M&A market, makes me extremely bullish on the mobility sector. I believe there are plenty of exciting opportunities for startups to innovate and to build category-leading businesses. Therefore, if you are a founder aiming at shaping the future of mobility, I’d love to hear from you. Moreover, I’d like this post to be a starting point for general discussion — no matter if you’re a founder, industry expert or fellow investor — so feel free to reach out at kiltz@uvcpartners.com. Disclaimer: UVC Partners is an investor in Blickfeld, FAZUA, FlixBus, Free2Move (formerly Carjump), Isar Aerospace, TWAICE Technologies, VEACT and Vimcar. 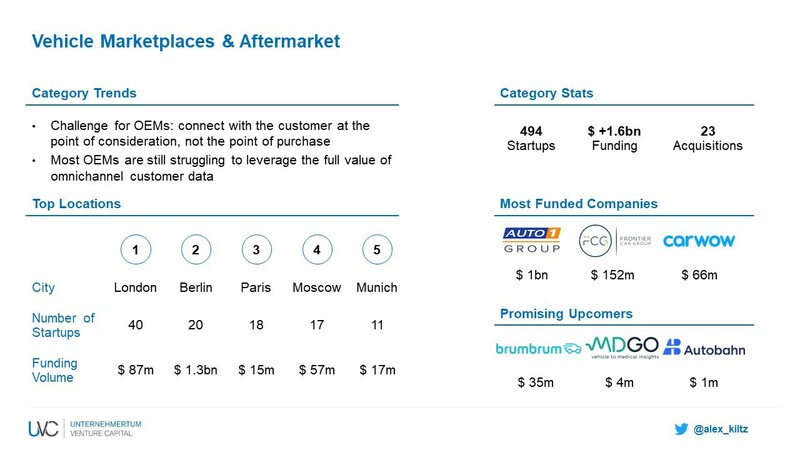 Early-stage VC @UVC_Partners investing in mobility, enterprise software & industrial technology startups in Europe.